Patron of no less than three countries, St. George is no doubt amongst Christendom's most beloved saints. He is the model of duty, humility, and service. Less well known than his fight with the dragon, is the heroic story of his martyrdom under Diocletian. Early Christians were captivated by the life of Saint George, that many churches to this day bear his name. His renown even crosses the religious divide. It is said in Israel there is a church dedicated to St. George where Christians and Muslims pray side by side. But now, the story. During his military service in the Roman army, St. George found himself stationed in Libya. On leave in Tripoli, he met an old man who came from an oasis town that was plagued by a great beast. He recalled how many had fallen to the creature, and that the King sought to find someone who could deliver this evil from his land. St. George was moved with compassion, so he offered to help. The old man was surprised to hear that a Roman soldier would care about the troubles of some distant people. The two men acquired provisions, and travelled south across the Sahara desert. They eventually came to the town where St. George was brought to meet with the king of the land. The king recounted to the young soldier that this beast was guarding the town oasis, which was the only source of water in the region. To appease its appetite, many people's livestock had been given to the beast based upon a lot. In the preceding day, things had become personal for the king. His daughter had gone down to the lake and had been stranded on a rock in the middle of the water with the creature present. St. George told the king he would return her safely, and quickly set out to rescue her from the beast. As he approached the lake, St. George saw the beautiful princess and called out to her. At that moment, the dragon rose out of the lake and challenged St. George. He mounted his horse, made the sign of the cross, and charged the dragon. He pierced its side with his lance, but in doing so, it shattered into pieces. The creature writhed in pain. St. George acted fast and taking advantage of its confusion, he charged the beast with his sword, slashing and stabbing at the creature's wound. The dragon fell to the ground, its head slumped, and it succumbed to its wounds. The princess seeing that it was safe, swam back to shore, thanking St. George, who was richly honored by the King and his people. For his heroism, and his faith, many are said to have converted to the faith, and the king built a church by the lake. St. George stayed with the king for a few days, but eventually returned to Tripoli to rejoin his unit. 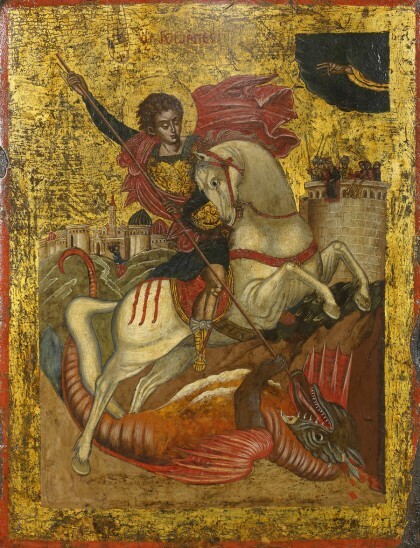 St. George would later be called to renounce Christ, or face death. The young soldier won the crown of martyrdom as he was beheaded according to the orders of Diocletian. The waters of the lake where St. George slew the dragon are said to have worked many miracles in the years after St. George's death. For many Christians this story can be seen in light of Christ's triumph over death, or St. Michael's defeat of Satan in St. John's Apocalypse. But I think this story is best seen as an injunction to all of us, to fight sin and overcome our passions. St. Paul reminds us in his epistle to the Hebrews that we have not yet shed blood in our struggle against sin (Heb 12:4). We must "fight the good fight" (1 Tim 6:12) until our death, whenver that may be. St. George serves as a model for us, how we should humbly, and courageously fight to overcome our sinful tendencies with all our might. May God grant you the strength to tackle your sins.